Instantly Win 1 of 63 Smartphones, 21 Tablets + Many Other Awesome Prizes! 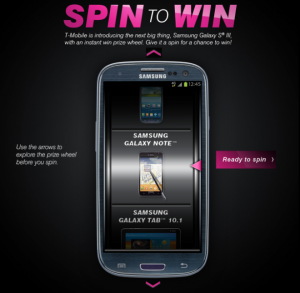 Enter T-Mobile's Spin to Win Game to instantly win 1 of 63 Samsung Galaxy smartphones, 21 Samsung Galaxy Tabs and much more! 630 prizes all together. You can spin everyday until 7/31/12. As much as I try to enter for these new cell phones, one would think I'm an expert, but not! I just would love to have an updated cell besides this 8 y/o Kyocera.